The emblem and logo used by the US Paratroopers Motorcycle Association is the sole property of Scott Riley and Dave Field. The US Paratroopers Motorcycle Association patch and logo cannot be reproduced without license from the owners. 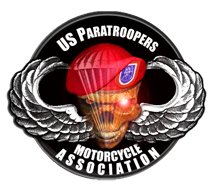 The emblem of the US Paratroopers Motorcycle Association consists of an image of the U.S. Army's Basic Parachutist Badge with a forward-facing skull with glowing eyes wearing a maroon beret centered on and obscuring the badge's canopy. The badge is centered on a circular field of black. The Basic Parachutist Badge and the maroon beret represent the training and qualification required to be a Paratrooper. The skull and glowing eyes represent the lethality and intensity of Paratroopers as well as the inherent danger associated with parachute operations. The field of black represents the typical nighttime scheduling of parachute assaults. The principal office of the US Paratroopers Motorcycle Association is located in Lakewood, Washington. The designation of the county or state of the US Paratroopers Motorcycle Association principal office may be changed by amendment of these by-laws. The board of officers may change the principal office from one location to another by noting the changed address and effective date below, and such changes shall not be deemed, nor require, an amendment of these by-laws. To set an example of brotherhood and patriotism throughout our country. To promote interest in the history of the Airborne. To create and maintain camaraderie among military qualified parachutists from all branches of the United States Armed Forces and foreign military forces. To conduct association functions and activities in a manner befitting the members of the US Paratroopers Motorcycle Association members as well as the associations Auxiliary members. To participate in activities of a patriotic nature. To support veterans organizations in any way possible. B) The only Acceptable proof for membership to the US Paratroopers Motorcycle Association will be military documentation confirming one's status as a military qualified parachutist. D) Should a full member resign they will be given a 5 day grace period to rescind their resignation with no repercussions. After the 5-day grace period a member will have to re-apply for membership as a new member and will require Board of Directors approval. E) Active members of the US Paratroopers Motorcycle Association who after 3 years become infirmed, disabled or otherwise are unable to ride their motorcycles will be able to keep their patch and be retired as lifetime members in good standing of the US Paratroopers Motorcycle Association. D) Should a support member resign they will be given a 5 day grace period to rescind their resignation with no repercussions. After the 5-day grace period a member will have to re-apply for membership as a new member and will require Board of Directors approval. By applying for membership with the US Paratroopers Motorcycle Association, you are giving the US Paratroopers Motorcycle Association and its Board of Directors the right to verify any membership application, DD214, documentation, orders and records. All members MUST conduct themselves in a manner that is not an embarrassment to themselves, the US Paratroopers Motorcycle Association, or the United States of America. Section 3.5-1- The USPMA is not affiliated with any MOTORCYCLE CLUB and does not claim any territory. As many members may belong to other groups or clubs, it is hereby stated that the USPMA is absolutely neutral. USPMA does not support or claim allegiance to any MOTORCYCLE CLUB. Section 3.5-2- The USPMA Patch may not be altered in any way. The only authorized USPMA patch will be designed and produced with the express permission of the BOD. At no time will there be a back patch or a multipart patch authorized. Section 3.5-3- Wear of the USPMA patch is up to the individual member. The patch can be worn anywhere the member sees fit as long as it is not altered to appear to be an affiliation with or a subsidiary of any MOTORCYCLE CLUB or organization. At no time will the USPMA patch be authorized for wear on any piece of clothing having the colors of any MOTORCYCLE CLUB. The recommended location for the wear of the USPMA patch is upper right side (right breast) but it is in no way mandatory. The patch can be sewn on the back of a vest/jacket as long as it is not the centerpiece. Section 3.5-4- If a member resigns or is put out for any reason; they are no longer authorized to wear the patch and ANY PATCH OR PATCHES they may have MUST be returned to the association. Full purchase price will be refunded. All full members must possess a valid motorcycle drivers license endorsed by their state as well as proof of insurance for their motorcycle(if required by that state). A) In the event of misconduct of a member, under the by-laws of the US Paratroopers Motorcycle Association, the Board of Directors possesses the right to revoke that member’s membership. Misconduct is defined as failure to abide by the by-laws of the US Paratroopers Motorcycle Association and any organization that the US Paratroopers Motorcycle Association supports. B) Bringing dishonor upon the US Paratroopers Motorcycle Association in action, word(s), or deeds. Always remember WE ARE NOT, NOR DO WE CLAIM TO BE, A MOTORCYCLE CLUB! WE DO NOT HAVE COLORS! WE HAVE A VETERANS INSIGNIA!! Each member in good standing, shall be eligible to one vote. Any member may resign by filing a written resignation with the secretary. A member can have their membership terminated by a majority vote of the membership. The Board of Directors shall have the authority to establish and define non-voting categories of membership. Non-voting categories of membership are not eligible to cast vote in any association activities, elections and proposed transactions or arrangements. Regular meetings of the members will be held quarterly at a time and place designated by the President/Commander. An annual meeting of the members shall take place every year, and the specific date, time, and location of which will be designated by the President/Commander. At the annual meetings members shall elect officers, receive reports of activities of the association, and determine the direction of the association for the coming year. Special meetings may be called by the President/Commander, the Board of Directors, or a simple majority of the Board of Directors. A petition signed by five percent of voting members may also call a special meeting. Printed notice of each meeting shall be given to each voting member, by mail not less than two weeks prior to the meeting. Membership dues are $10 (Ten Dollars) annually. Members will be issued a Membership Card and business cards upon receipt of dues. Dues can be paid in 1, 2, 3, 5, and 10 year increments or Lifetime($150). Patches cost $5/each which includes shipping. The officers of the US Paratroopers Motorcycle Association shall be President (Commander), Vice President (Executive Officer), SGT at Arms, Secretary, and Treasurer. The officers of the US Paratroopers Motorcycle Association must be full members in good standing and cannot be officers in any MC. The Board of Directors, are the officers holding the positions of President (Commander), Vice President (Executive Officer), Secretary, Treasurer, and Sergeant at Arms. The Board of Directors constitutes the executive Board, responsible for the execution, through its officers of the authorized policies, by majority votes, fills vacancies in any office Board of Directors and submits to the meetings and recommendations affecting policies of the Association that have been previously approved. The President (Commander) is the Chief Executive Officer of the Association. All matters concerning relations between the association and any outside person or organization should be routed to the President (Commander) for appropriate action. The President (Commander) will preside over all meetings of the Association; act as ex-officer member of all committees, issue the call for regular and special Board of Directors meetings, schedule regular elections, and are sure they are held in accordance with this constitution, and carry out the directives of the Board of Directors. The Secretary and Treasurer are both accountable to the President (Commander) and allow the President (commander) to fill these positions at his discretion, and assume all duties to office. The Vice President (Executive Officer) shall coordinate all committees, and supervise plans for all events. The Vice President (Executive Officer) shall act as an intermediary between the President (Commander) and the members. Additionally the Vice President (Executive Officer is second in command to the President (Commander) or Officer in their absence, and assumes all duties to the office. The Secretary will be appointed by and serve at the discretion of the President and is responsible for making and keeping all records, including the membership list, the By-laws, Rules of order, Standing Rules, records of all committee appointments, all written reports, copies of all correspondence between the Association and any outside person or organization, and shall keep correct minutes of the proceedings of the Board of Directors and general membership meetings. The Treasurer will be appointed by and serve at the discretion of the President The Treasurer shall keep correct and complete books and record of account. Keeps all funds of the Association. The Sergeant at Arms is responsible for ensuring that By-laws and Standing rules of order of the Association are not violated, and that orders of the Officers are carried out in an expeditious manner. He is responsible for policing and keeping order at all Association events. The Sergeant at Arms is responsible for the safety and security of the Association. The Sergeant at Arms will maintain order during meetings. The Road Captain is an appointed position by the President (Commander). Road Captain is responsible for all Association runs. He shall research, plan, and organize all runs. During actual time on the road or at intermediate stops during a run, he shall act as ranking officer, deferring only to the President (Commander) or Vice President (Executive Officer). Delegations will be appointed by the President (Commander) to represent the association at any convention, meeting, rally, or other assembly that may be deemed necessary, and all delegations are authorized to exercise only those powers specifically vested in them by the Association Board of Directors. The Board of Directors, except as otherwise provided by these By-laws, may by resolution authorize any officer or agent of the Association to enter into any contract or execute and deliver any instrument in the name of and on behalf of the Association, and such authority may be general or confined to specific instances. Unless authorized, no officer, agent or employee shall have any power or authority to bind the Association by any contract or engagement or to pledge its credit or to render it liable monetarily for any purpose or in any amount. Except as otherwise specifically determined by resolution of the Board of Directors, or as otherwise required by law, checks, drafts, promissory notes, orders for the payment of money and other evidence of indebtedness shall be signed by the Treasurer and countersigned by the President (Commander) of the Association. The Board of Directors may accept on behalf of the Association any contribution, gift, bequest, or device for the non-profit purposes of this Association. These By-laws may be altered, or repealed and new By-laws adopted at the yearly Meeting by a two-thirds vote of the members present or by the Board of Directors, only to a revised conflicting Article and/or Section. Approved or accepted amendments take effect immediately. Any changes to any Article and/or Section of the Association of the US Paratroopers Motorcycle Association will be discussed and voted on by a quorum. If any US Paratroopers Motorcycle Association By-laws conflicts with Federal and/or State or Virginia Domestic Non-profit Veterans 501(c) (19) provisions and/or statutes, the conflicting Article(s) and/or Sections(s) shall be revised, by the Board of Directors and shall take effect immediately. 22 October 2008- 1.3 Amended to show Principle location changed to Hampton, Virginia from Dallas, Georgia. 28 October 2008- 3.2 Amended to create the Member Group "Support Members". 28 October 2008- 3.3 Added to redefine "Auxiliary Members"
26 November 2008- 3.11 Amended to include Support and Auxiliary Members. 26 September 2012 1.3 Amended to show Principle location changed to Lakewood, Washington from Hampton, Virginia.